On August 1st, 2011, Wind Power replaced the Weather Center's anemometer (wind) sensor with a brand new 'Pro Anemometer' from Peetbros.com. The 'Pro Anemometer' sensor has larger cups and a longer & weighted wind vane which provides more accurate wind speeds and direction measurements. During the replacement, Kevin ran his digital camera up the mast a couple times and took some videos. The static images and videos below are from that ride up and down the mast. 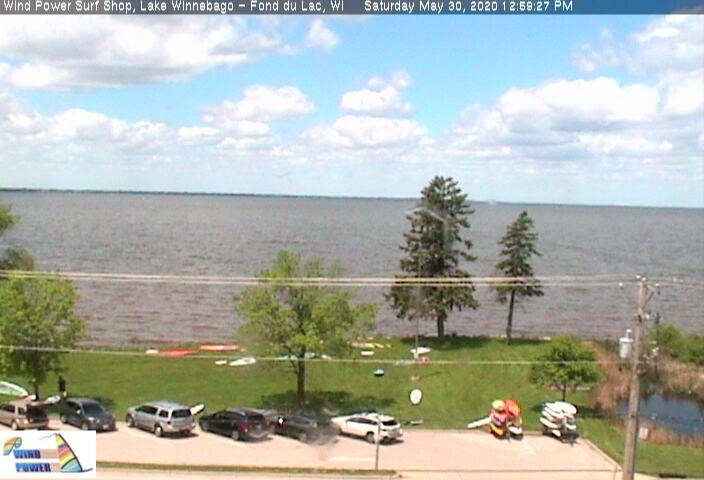 It really gives you an idea of how high the sensor is and a nice view of Roosevelt Park and South Lake Winnebago. For more information and images of the sensor and the mast it is mounted on, see the sensor info page. Wind Power would like to put a Live webcam at the top of the mast at some point. A PTZ (pan-tilt-zoom) camera would be ideal as it allows camera position to be adjusted. Newer webcams have ePTZ which allows a higher resolution camera mounted in a fixed position to serve up a portion of the higher resolution image to effectively change the camera's view.